Protest rallies were held today and yesterday in support of the demand of striking workers in the country’s biggest export zone for the reinstatement of illegally fired employees. The strike entered its fifth day as the Department of Labor and Employment convened another mediation meeting today between the union and management of the strikebound Seung Yeun Techonology Industries Corp. (SYTIC). “We demand the reinstatement of the SYTIC 21 who were terminated for their union activities and the redress of labor standards violations. 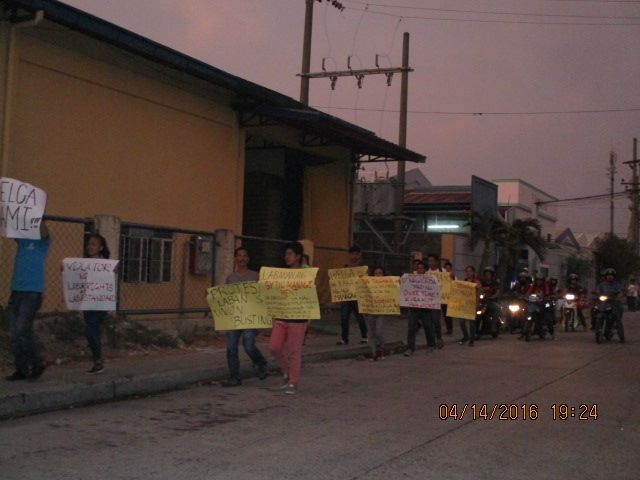 If not then protests inside and outside the Cavite EPZA will escalate,” stated Frederick Bayot, union president of the SYTIC workers. This morning more than 100 members of the partylist group Partido Manggagawa (PM) and the union Philippine Airlines Employees Association (PALEA) staged a solidarity rally to express for the striking workers while the mediation meeting was ongoing. Last night the SYTIC strikers and their supporters marched around the export zone and hopped from one factory to another to solicit support from EPZA workers. “We call on SYTIC’s customers to make good on their code of conduct pledge. These big electronics companies have promised to respect freedom of association and labor standards in their supply chains, which includes SYTIC,” urged Bayot. The three biggest customers of SYTIC are ON Semiconductor Philippines Inc. in Carmona, Cavite, Analog Devices General Trias Inc. in the Gateway Business Park in General Trias, Cavite and Texas Instruments factories in Baguio and Clark ecozones. All are local subsidiaries of US multinational companies. ON Semiconductor is a spinoff of Motorola. SYTIC also supplies to Cavite-based factories of local subsidiaries of US electronics companies Maxim Integrated and Cypress. All these companies are members of the Electronic Industry Citizenship Coalition (EICC) which pledges to uphold freedom of association and labor standards in their companies and its supply chains. In its website, EICC avers that it is “a nonprofit coalition of electronics companies committed to supporting the rights and wellbeing of workers and communities affected by the global electronics supply chain.” EICC members are bound and accountable to a “code of conduct.” The code is a set of standards on social, environmental and ethical issues in the electronics industry supply chain. 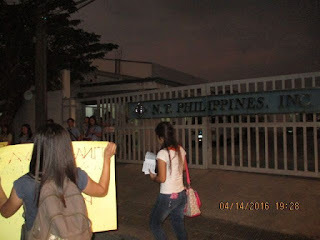 “Partido Manggagawa (PM) through its allies and contacts have made representation to the EICC and directly to SYTIC’s customers about the ongoing dispute. We ask that they respond in accordance with the provisions of the EICC code of conduct,” explained Dennis Sequena, a PM-Cavite coordinator. Since the strike begun last Monday, strikers were joined at the picketline by supporters from PM, PALEA, the labor center Sentro and workers from nearby EPZA factories.